A complaint about “sexually explicit” content in First French Kiss, a book that was included on the Taunton, Massachusetts, high school’s optional summer reading list, was struck down when school officials opted to keep the book in the curriculum. First French Kiss and Other Traumas by Adam Bagdasarian is an anthology of stories that follow Will as he moves through awkward phases of adolescence. From friendship to romance, Publisher’s Weekly describes the book as “evocative in its entwinement of childlike candor with adult wisdom.” According to Scholastic, the book is written for a grades 9-12 and discusses key topics like “character and values” and “culture and diversity,” which would appear to make it a good fit for any high school reading list. That said, though, where some stories capture an innocent humor, others, like the one after which the book is named, drew the ire of community members in Taunton when the book was included in the optional reading list. 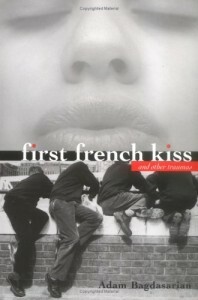 A 10-page story told in first-person recounting Will’s first “make-out” session, First French Kiss became the target of controversy when Assistant Superintendent Christopher Scully received a complaint about the “explicit sexual reference,” which called for the removal of the book from the reading list. Instead of removing the book from the list in a knee-jerk reaction to appease a single complainant (as we have sadly seen in the past), Scully submitted the book for a formal review. “We reviewed the request and read the book,” said Scully. In a unanimous vote, administrators opted to keep the book on the optional summer reading list due to a lack of identifiable objectionable content. It is up to individuals to decide what is appropriate for themselves… A book that draws the line for one family may not draw the line for another family. We have graphic novels, classics, lately there have been a lot of requests for books about the LGBTQ community… My job is to find the right fit to interest kids in reading. That is what it is all about … getting the kids to read.